I have been using the Osprey Veer Resource bag since 2010 as my ‘walking bag’ whenever I go out for a walk, or a short bike ride. I keep it to pretty minimal contents; mostly my iPad, a few pens and my Moleskine. Thats pretty much it most of the time. Other than two small irritations (more on that later) I am really in love with this bag, it has a great strap design so that it sits right on the small of the back when you are walking, and doesn’t interfere with your hands, or get in the way at all. Unlike a backpack which is hard to get into if you want something, you can just swing the veer around easily and access the contents on the move. It has a flap on the front that is secured with Velcro, and has a place for a few pens, and a small hidden pocket where I keep my Moleskine. The main compartment has a protective flap over the zippers to help keep moisture out, which I think is a really thoughtful design idea. I keep my iPad in there, as well as a larger journal or some other project from time to time. I will often throw in a bluetooth keyboard if I am going to do any long-form writing. On top is the best pocket on the bag, it is right where your hand naturally falls when you grab for the bag, and I use it to keep things I want instant access to. I keep a flashlight there, and headphones, a cliff-bar and a multi-tool most of the time. I know that this bag has a pretty strong following in the concealed carry community because of this pocket, it almost seems engineered for CC. There is a place to put a water-bottle, and in my case; I keep a 18oz Hydrofask there most of the time. The only 2 things I don’t like about the bag, are the poorly designed outside flap pocket, it has a very short zipper which restricts access, and seems like it would have been better if it were a vertical zipper instead. the smart-phone pocket on the strap is also too small. It barely fits an iPhone 5s, and I don’t think it would fit a 6 at all. At this point (2 years after Osprey discontinued production) you are probably going to have a hard time finding one outside of eBay, but I still think its the best small walking bag ever made. 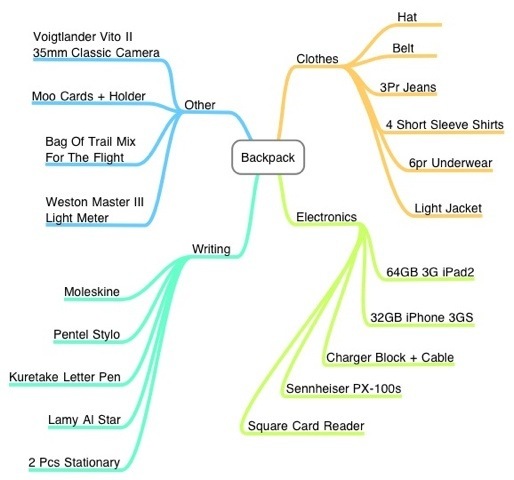 This Mind-Map is a list of everything I took with me on a 5 day trip to Portland. As you can see I went light and minimal. The one thing I decided to take regardless of need, is my classic Voigtlander Vito II camera. Yes it is 60 years old and l could easily just take photos with my iPhone, but there is something special about that camera. I love it. I also took along a Weston Master III light meter. Again old: it was made in the late 40s, but in conjunction with the Vito, it is like stepping back in time. This is the first trip I have made that I have decided to leave my MacBook at home, and take my iPad instead. I debated this decision for a while, but in the end decided that if there was anything I really needed a full fledged computer for, I would just VNC back to my Mac at home. This trip is for pleasure anyway, I am going to try and avoid any ‘real work’ if I can.